Diamond solitaire engagement rings are classically stunning designs. While a single diamond may be deceptively simple, there are actually many beautiful styles of solitaires to choose from. With so many variations of classic solitaires available -- as well as many ways to personalize even a simple ring -- it is no surprise that solitaires are consistently the most popular type of engagement ring. Many couples choose a solitaire in order to concentrate on the diamond quality in a single, magnificent gem rather than settle for lower quality stones in a flashier design. This ring is set in a wide, white gold band that complements the dazzling diamond in the center of this setting. A solitaire can be set in metals such as yellow or white gold, platinum or silver. For those who enjoy wearing a mix of metals, consider a ring done in a two tone design such as this one done in both white and yellow gold. The austere beauty of a lone diamond is appealing, particularly for a bride-to-be who favors simple, classic fashion. An emerald cut stone is stunning and has a lot of sparkle. Try a cut that will show off the beauty of the stone while keeping with a classic look that will never go out of style. Solitaire diamonds come in a variety of shapes. This pear shape ring is a traditional solitaire design, but instead of the expected round or princess-cut shape uses something out of the ordinary. Most brides-to-be have an idea of what they want in a ring. If you are looking to surprise that special woman in your life, get an idea of what she prefers and what matches her personal style. A classic ring such as a marquise cut diamond is sure to please any woman who has it placed on her finger. Some men choose a solitaire because of its ease. By choosing a simple, single diamond for their marriage proposal, they can offer their beloved a beautiful ring that she can always cherish. Using a heart shape stone for a solitaire ring can be a great way to symbolize your love and commitment to each other. There is no reason to have a boring ring when there are many unique solitaire designs to choose from. 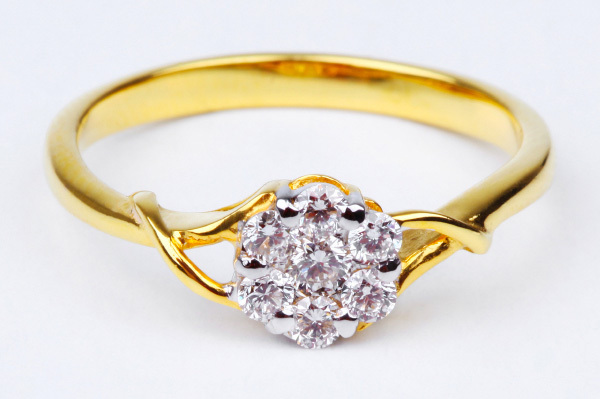 This ring uses a traditional gold band setting but goes into a unique design by placing the diamond in a square prong center setting. Diamond solitaires remain one of the most popular styles of engagement rings. Couples may choose these simple, elegant rings for a variety of reasons. When compared to more elaborate, multi-stone diamond ring designs, a solitaire can be a more affordable engagement ring as well.